Adi Yogpeeth is a registered yoga school with Yoga Alliance offers 200 hours 24 days Ayurveda yoga teacher training in Rishikesh, India. 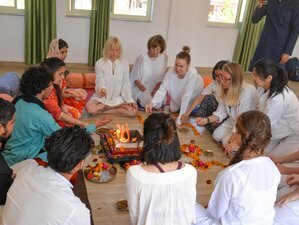 The main objective behind the foundation of this institute is to propagate the Vedic-Ayurvedic knowledge and yoga science to people and make them benefitted by its techniques. The highly experienced team of instructors have successfully trained over 1000 yoga students from all over the world. They provide a quiet spiritual serene atmosphere to learn Ayurveda with personal attention and guidance. This Ayurveda yoga teacher training course is suitable for beginner, intermediate, and advanced level practitioners in Ayurveda and yoga. The curriculum covers all the theoretical aspects of yoga along with the practice. Apart from developing the art of teaching, students will also gain an in-depth understanding of the practice of therapeutic yoga asanas, philosophy, yoga anatomy, physiology, mantra chanting, chakras, kriyas, Ayurveda, yoga therapy, mudras, bandhas, pranayama, and meditation. Therefore, join Adi Yogpeeth for your personal and professional growth today. The healing system of Ayurveda is considered the oldest system of medicine in the world. With the increase in physical and mental illnesses brought about by modern living, more and more people are now looking for the right guidance to lead healthy, balanced lives. Ayurveda and its principles of living have gained tremendous popularity in recent times. As a result, there is a great demand for authentic Ayurvedic with yoga knowledge and lifestyle guidance. The Ayurvedic course Adi Yogpeeth offers provides you with an opportunity to learn about various aspects of healthy living expounded by Ayurveda. The course aims to perfectly balance physical as well as mental well-being, which is why you lay equal stress on subjects like yoga philosophy and meditation. They have well-learned yoga gurus faculty who impart traditional yoga knowledge to students and their class size is also intimate for good feedback, group discussion, and yoga practice. Prana means 'breath' or 'life force'. Students get introduced to the practice of pranayama or controlling one’s breath - an important prerequisite to gaining control of one’s mind. Students learn about the significance and meaning of some of the practices of the Sanatana Dharma. During this course, you will enjoy an Ayurvedic massage. Indira Gandhi International Airport (DEL) to Rishikesh by car is a six to seven-hour journey. The taxi from Indira Gandhi International Airport (DEL) to Rishikesh can also be arranged for 65 USD by Adi Yogpeeth. At Indira Gandhi International Airport (DEL), the school driver will be waiting with your name board and will transfer you to the school.